An elegant villa and cottage with gardens and pool in a truly unspoilt village. N.B. PLEASE MAKE AN ENQUIRY BEFORE BOOKING (BY CLICKING "ASK OWNER A QUESTION" ) TO CLARIFY WHETHER OPTIONAL COTTAGE IS REQUIRED. A handsome villa, with delightful mature gardens & a large private pool. Experience a truly authentic village life, with friendly Portuguese neighbours, plus comfort and privacy - a rare combination ! The Villa has a superb sunny (25 foot) sitting room at first floor level, with wood-burning stove, overlooking a pasture often grazed by goats. 2 French windows lead onto a wide sun terrace looking towards the coastal cliffs. Steps curve down to the mature walled garden containing peach, orange, lemon and mandarin trees, fruiting vines & a gazebo. The adjacent private pool is surrounded by floral beds in its own walled garden, reached by a gate in the Villa garden, thus enabling it to be secured safeguarding infants. The ground floor has 2 large twin bedrooms with French windows into the garden & 2 bathrooms (baths & showers). The optional cottage (Casita) has a sitting room (with a sofa which can become two single futons), 1 twin bedroom & bathroom. There is air-conditioning , and heating if required in winter months. A generous welcome pack of food and wine is included. An English babysitter is available. Additional beds, cots and high chair are available. The house has views over open countryside and over the quaint village roof tops to the coast. The area, being a National Park, is generally agreed to be the most beautiful in the Algarve and is richly endowed with wild flowers, rare birds and butterflies. Golf, fishing, riding, tennis and sailing, are all only a few minutes away, as are little whitewashed fishing villages where the morning catch is sold and cooked, very cheaply. N.B. PLEASE INDICATE WHEN ENQUIRING WHETHER YOU REQUIRE THE VILLA ALONE OR THE VILLA PLUS THE CASITA (OPTIONAL COTTAGE). PLEASE DO NOT BOOK YOUR FLIGHTS UNTIL THE OWNER HAS CONFIRMED AVAILABILITY. The owner (not Patricia , who is a friend of the owner and is dealing with the bookings ) writes : I was a barrister, a Cambridge don and a schoolmaster and, after retirement , a professional artist, having been an amateur painter for many years previously. I hold regular exhibitions in London, Paris, and Oundle where I still live, in a 500 year old drovers' inn, with an art gallery converted from the ancient stables. I am also a keen musician , playing the bassoon in various chamber ensembles, and on numerous occasions have brought chamber groups to the Villa and given concerts in the Algarve. The owner (not Patricia) writes : I found this charming village almost by chance 35 years ago. I had come to Portugal in search of beautiful places to paint, but, dismayed by the wanton development along most of the Algarve coast, penetrated to the west Algarve,which was then virtually unknown, and discovered this delightful village, only a few minutes walk from the most stunning coast. I was painting there when a villager told me about a ruined manor house (the Casa) which was for sale very cheaply, and having fallen in love with the village, I rashly bought it at once. This was the start of over 10 years restoration, and subsequently, the designing of a smaller house (the Villa) in its grounds, which is now completely separate and the conversion of two old barns into a cottage (Casita) in the Villa grounds. It was a somewhat fraught experience at the time, but being finished it is an unfailing joy whenever I go there, either to paint or with friends and family (see photo, on the beach). Astonishingly, the village and environs have hardly changed since my first arrival and I bless the day when I made that impetuous decision to buy the old ruin. The owner (not Patricia) writes : There is too much to summarise here, but, briefly, I love the tranquility and beauty of the place with many of the old village characters whom I have known for 35 years, the wonderful views in all directions, the sense of peace and privacy in my gardens and pools, the astonishing bird life and the timeless quality of the place. I can't do justice to it here - you need to experience it for yourself ! VILLA. 2 full bathrooms CASITA (cottage) : 1 shower room with basin and toilet. Good mobile 'phone signal. No fixed land line, but free wi-fi available so that wi-fi calls can be made. The property has wi-fi connection. Wood burning stove, TV and DVD. The sofa in the sitting room can be converted into a double bed. Internet connection offers wide range of programmes, both British and European. The facilities listed include both the Villa and the optional Casita (cottage). A generous welcome pack of food and wine is provided. English speaking baby-sitter available. Housekeeper speaks English. The location is delightful: in a village that still remains largely undeveloped and overlooking open fields in one direction and with a long view from the terrace, across village rooftops to the not-so-distant coast, in the other. There's a beautiful beach reached via a lovely country walk. The village has an excellent - and-amazing-value - restaurant within easy walking distance of the house and there's plenty to do and see in the area. All facilities that one could sensibly require are present; the rooms are generously-sized and the garden is delightful, including a secluded and good-sized pool. Everything was clean and well-maintained. Highly recommended! We thoroughly enjoyed our stay at the Villa dos Arcos. The quiet location and the spacious living accommodation, not to mention the lovely pool, really made our stay in Portugal memorable. Figueira is one of the few unspoilt places on the South West coast of Portugal and one of the highlights was walking to Figueria beach, wonderfully remote and no other souls to be found, I suppose you sacrifice remoteness for lack of amenities. However there were other beaches nearby with facilities and restaurants with some great shell fish. The description of the villa was accurate and we thoroughly enjoyed our stay. We ate out most evenings but the kitchen was well appointed for the evenings we decided to stay in. The local supermarket was excellent and very inexpensive compared to the UK. I have passed on the details to several friends and look forward to returning next year. The Villa is just as described in the website : spotlessly clean, spacious, with lovely views from the windows and terrace. It is full of local character, with a beautiful garden and a large swimming pool which has been completely renovated this year. It is tastefully decorated and well equipped, and the caretaker who met us was very helpful in answering all our questions. We loved being in a real Portuguese village, with its cobbled streets and quaint little shops, and, as a bonus, a really excellent restaurant where delicious home-cooked meals were extremely modestly priced. The nearest beach was a joy - hardly anyone else on it, with perfect sand and sheltered by cliffs ; the children loved exploring the caves. It was so good to find a comfortable, stylish villa which was not on one of the many developments scarring the coastline further to the east. We would recommend this unreservedly, unless you or your family want night life - there is none ! But there are many restaurants in other nearby villages, and we were never disappointed. Finally, if you are a keen bird-watcher, this is a paradise - even a hoopoe in the garden, and lots of egrets in the pasture immediately outside. Go before it gets spoilt. With the coast so heavily developed it is a delight to still find a village which retains its traditional character. The villa is a traditional dwelling located on the edge of the village with lovely views of the surrounding countryside from its spacious first floor sitting room. There is a sunny walled garden with mature plants and this leads to the villa's own pool. Within a short distance of the villa are a number of delightful beaches. The village has a lovely small restaurant where home cooked food is available in friendly informal surroundings. The village is full of narrow streets, but we never had any difficulty parking our hire car right next to the villa. The villa was well maintained and although we had no problems it was reassuring to know that that there was someone nearby to help with any difficulties. A piece of old Portugal away from the madding crowds, and thoroughly recommended. Highly recommend this pretty villa . The directions we were given and assistance to get to the property was first class. The villa was very pretty, just like the photos. It was spotlessly clean. Tracy, the housekeeper had left a welcome pack of food and a bottle of wine for us, she was extremely helpful and friendly throughout our week's stay. We were blessed with mainly sunny weather but as it was the middle of March the nights were chilly, the log burner in the living room made the room look lovely and was really warm. We weren't familiar with this area of Portugal but really enjoyed the non tourist environment. We went some lovely walks to the unspoiled beaches, which were absoulutely beautiful and enjoyed the cliff top walks to the pretty little resort of Salema which was only about a mile away by road. There was plenty information in the villa about the local and surrounding areas. The patio areas were wee sun traps. We mainly ate in or had barbecues as our family and 2 year old grandson were staying with us but really enjoyed a delicious but extremely cheap lunch in one of the local bar/restaurants Saphinas. We had a surprise visit in the field adjacent to the villa of sheep, lambs and goats along with the melodic sound of the bells they wore round their necks - pure joy for our wee grandson! 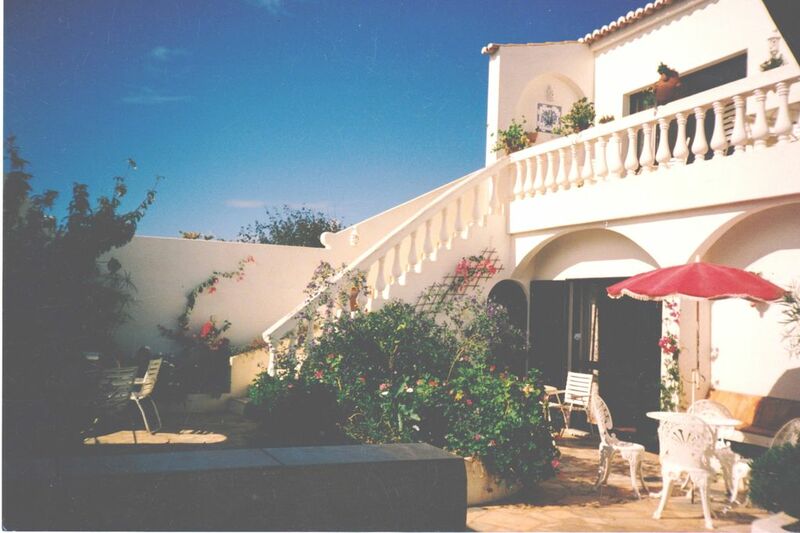 The village is located in the West Algarve approx 8 miles west of the historic town of Lagos. The village has changed little with the twentieth century. Brightly painted houses look onto winding cobbled streets. The area, generally agreed to be the most beautiful in the Algarve, consists of gently rolling hills with a wealth of walks through fig and almond groves. This National Park is the Algarve's only conservation area and is richly endowed with wild flowers and an astonishing range of birds and rare butterflies. A bird- watching log is kept in the Villa and features frequent references to various eagles, harriers, egrets, hoopoes, vultures and warblers. Expert guided bird-watching tours are available. The village is under a mile from the completely untouched coastline of small sandy coves, and stands approximately 100 feet above sea level in open countryside overlooking a wooded valley dotted with white windmills and eucalyptus forests. Golf: Parque da Floresta is 1/2 kilometres away; this 18 hole championship golf course (due to be expanded to 36 holes) is in a beautifully landscaped setting and has a health centre, swimming pools, tennis courts (floodlit), bowling green, restaurants, club facilities, gym, sauna, jacuzzi, classes, competitions and social events. Concessionary rates have been negotiated via the local representative. These rates are for the Villa. The Casita prices are considerably lower, often less than half the Villa prices.